Ergonomic handle design fits in palm and offers extra leverage of stapling force. The Max HD-12N/13 is a heavy-duty stapler for 30 to 110 sheets. Its ergonomic handle design fits in palm and offers extra leverage of stapling force. The durable full metal construction encased by high impact plastic cover. The HD-12N/13 has an adjustable paper stopper for throat depth adjustment, and has a staple window slot that shows the size of the staple currently in the staple channel. Other great features include rubber base that protects desk and provides firm stapling control, and rear loading for easy and quick to reload staples. The Max HD-12N/13 110-Sheet Heavy Duty Stapler is backed by a 1-year warranty. Durable full metal construction encased by high impact plastic cover. Adjustable Paper Stopper enables to adjust throat depth. Rubber base protects desk and provides firm stapling control. Staple window slot shows the size of the staple currently in the staple channel. Rear loading makes it easy and quick to relaod staples. 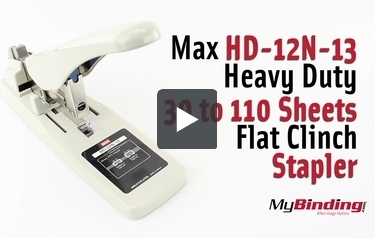 Transcript: This is the Max HD-12N-13 Heavy Duty 30 to 110 Sheets Flat Clinch Stapler! To load staplers, first pinch on the end of the staple pusher to then pull it out the back. From there, place in your staples. Then slip the pusher back in place. As a reminder there are instructions on the side. Next adjust the backstop for your project. You can lock it in place by flipping down this tab. In this position it cannot move backward, but do note that it can move forward still. For the best results, use the listed staples under the “Product Details” or the front of the stapler. This is the Max HD-12N-13 Heavy Duty 30 to 110 Sheets Flat Clinch Stapler! Now you can staple up to 110 sheets at a time! If you need to swap your staples out, pull the pusher back out and tip the unit for the staples to slide out. If they do not slide out, you can use the opening in the front to push them out with something small and strong enough.